You must be a member of the Málaga DinnerNations Group to attend this activity. Would you like to join this group? 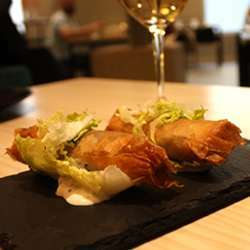 Let's kick off the year with a delicious dinner at Protected content one the hot new restaurants in central Malaga. We have an exciting three course menu with some drinks included. We hope to see a great group of friendly faces, old and new, for this fun event. Please let me know your preference - ternera or bacalao - for the main course. Please be ready to pay the full amount of 35 euros plus tip in cash on arrival. 2 bebidas por comensal - Refrescos, agua, cerveza, tinto de verano.